Roll back the gaming years with something retro for your home this Christmas – I’m talking about the SupaBoy Handheld Video Game Console here. This little puppy was specially designed to look like that of your classic SNES controller for very good reason. After all, your hands would probably gain their old strength the moment they take a grip of the SupaBoy, just like how the character King Theoden from the second part of the Lord of the Rings trilogy was told by Gandalf to remember his old strength better when his fingers grasped his own sword. All those classic Street Fighter II combos ought to flow through without you batting an eyelid after a while. As mentioned, the Supa Sweet Handheld Console is specially shaped like a SNES controller, complete with its own 3.5″ display, not to mention the ability to handle both SNES as well as Super Famicom cartridges. 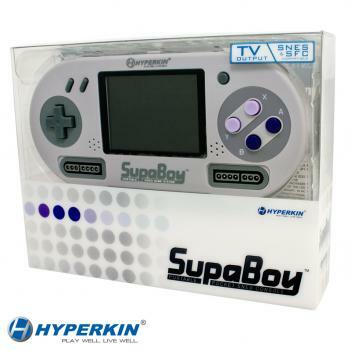 I know that the SupaBoy Handheld Video Game Console has been in development for a long time already, but it is nice to see that the device is finally being launched in time for the Christmas shopping season. More on the SupaBoy in the extended post. Emulating the original SNES controller in terms of design including a D-pad, face buttons, as well as right and left shoulder buttons, the SupaBoy will also be accompanied by a couple of front loading ports which are compatible with full-size SNES controllers, not to mention video/audio out, so that up to a couple of players can enjoy a button mashing time of blood-free Mortal Kombat on a standard TV screen. I guess there is still some life left in the old school CRT TV that you have stashed away in the attic, no? The SupaBoy can be yours for $79.99 a pop. Or you could just pick up the a320 pocket retro game ( http://www.thinkgeek.com/clearance/on-sale/bd6f/) on sale for $70. That plays snes, nes, genesis, etc….